Click below to see highlights from our 2012 BSMPG Summer Seminar featuring Andrea Hudy from the University of Kansas and Keith D'Amelio from Nike. More highlights are set to come in the next few weeks so stay tuned! A special thanks again to our SPONSORS! I recently attended the BSMPG Summer 2012 conference, and over the course of two days I realised how little I know. I got the opportunity to hear a number of really smart people speak (including Bill Knowles, Craig Liebenson, Dr John DiMuro, Mark Toomey, Art Horne, Dr Pete Viteritti, Keith D’Amelio, Chris Powers, Irving Schrexnayder and Alan Grodin). Firstly, a huge thanks to Art Horne and the rest of the people who made the conference possible. Fingers crossed I’ll be able to make the trip across the pond for it next year. Here’s a snapshot of my notes which I scribbled down throughout the conference. “Injury is an opportunity to become a better athlete”. We shouldn’t be talking about return to play, we should be talking about a return to competition. Are any of your athletes load compromised, or joint compromised? The return to competitive strategy should be months or years long, not weeks. Continue to read this review by clicking HERE. This past weekend I had the pleasure of heading to Boston for my third Boston Sports Medicine and Performance Group (BSMPG) Summer Seminar. I wasn’t sure how it was going to top last year’s line-up and I can’t say for sure that it did, but it was at least on par. I was able to hear some very informative presentations from Bill Knowles, Craig Liebenson, Sean Skahan, Dan Boothby, Pete Friesen, Boo Schexnayder, Joel Jamieson, Cal Dietz, Chris Powers and Alan Grodin. The following are the three things that I am going to implement into my program at Michigan Tech as soon as I get back to Houghton tomorrow (I am writing this on the plane trip home). Joel Jamieson spoke about allostasis and the training process. According to Joel, Allostasis is “the varying integrated adaptive responses taken by the body in order to maintain homeostasis at all times and in all circumstances as necessary to keep the body alive.” We only have a certain amount of energy (called the allostatic reserve) to accomplish these adaptations. Training is obviously one of the stressors that can disrupt homeostasis, causing allostasis to occur. However, if the training is too much in terms of volume, intensity, or both, then that allostatic reserve can be drained and we won’t get the training adaptations that we are looking for. Therefore, it is essential to monitor the recovery levels of our athletes and quantify their training load to maintain that allostatic reserve and ensure readiness for training. Unfortunately, at Michigan Tech we don’t have the resources for an Omega Wave or even other heart rate variability technology. I also don’t have the time to measure everyone’s vertical jump or grip strength on a regular basis. However we can use subjective measures to tell how an athlete is feeling and how they perceive their training. We will now have the athletes rate on a scale of one to ten on how ready they feel to train that day after the warm-up (it’s best to do it after the warm-up because athletes rarely feel ready before, sometimes I don’t feel fully ready until after the warm-up) and they will rate their perceived difficulty and intensity after the training session. This will allow me to quantify how they are responding to training and make adjustments as needed. In our second, third and fourth phases of plyometric training we use hurdles to jump over and in the past we have allowed our athletes to bring their knees up, sometimes all the way to their chest in order to clear the hurdle. During Boo Schexnayder’s presentation, he repeatedly discussed the importance of posture while jumping and that the set should be stopped if posture is lost at any point. Continue to read by clicking HERE. Year after year, Art Horne and the gang at the Boston Sports Medicine and Performance Group host their anual Summer Seminar. Having heard nothing but positive feedback from colleagues who have attended in the past, I decided that this would be the year to finally attend. Living in Western Canada, it certainly isn’t easy to travel across the continent both from a time and financial perspective, but I felt that in order to continually better myself as a professional, attendance was a must. Like many of my previous educational endeavors, it was important for me to be 100% confident that this event was grounded in “educational conducivity” and not just a place where many of my friends were going to be. However, upon looking at the speaker lineup, it was more difficult to convince myself not to attend. Another year.... Another HUGE success!! 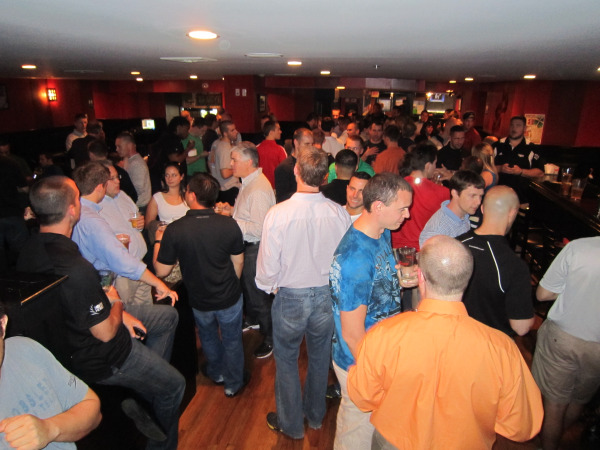 BSMPG would like to thank all the attendees who attended the 2012 BSMPG Summer Seminar. We wouldn't be able to run the leading Sports Medicine & Performance Seminar in the world without the leading Sports Medicine & Performance Professionals attending each and every year. And of course a huge thank you and shout out to all of our sponsors and speakers! Additional photos and details coming soon. We've already started planning for next year so stay tuned for details coming soon! Thanks again and it was so great to see everyone! TopCoder's Clinton Bonner will be guiding an in-depth panel discussion and presentation on sports performance and sports medicine today at 4pm-5:15 during our VIP Workshop. A revolution is coming in how not only do coaches and therapists approach performance and injury, but how technology is going to disrupt legacy approaches. Moneyball ten years go was a milestone for sport, but analytics and algorithms is still embryonic now in our profession. Attendees will leave with a blue print on getting started with data driven methodologies and how they are giving a competitive edge to the best teams in the world. During this session Jose Fernandez and Dr. Bruce Williams will do an assessment of an athlete, followed by group discussion on best practices with screening. A focus on gait and lower body mechanics is the highlight, supported by both biochemical and biomechanics monitoring. Evidence based medicine and the latest advancements of technology, therapy, and sports performance methods will be covered. With the advent of Moneyball, Jose and Bruce will show how they look at risk analysis with athletes in team sports from both a time management perspective and decision making process. Catch up with Jose, Bruce, and the rest of the country's top sports medicine and performance professionals at the 2012 BSMPG Summer Seminar May 19-20th!! Meet Gil Blander and learn more about Inside Tracker from Segterra at the 2012 BSMPG Summer Seminar. InsideTracker analyzes your bloodwork and gives you recommendations and an optimal eating plan. All InsideTracker recommendations are based on scientific evidence and tailored to you. If your life changes, so does InsideTracker. 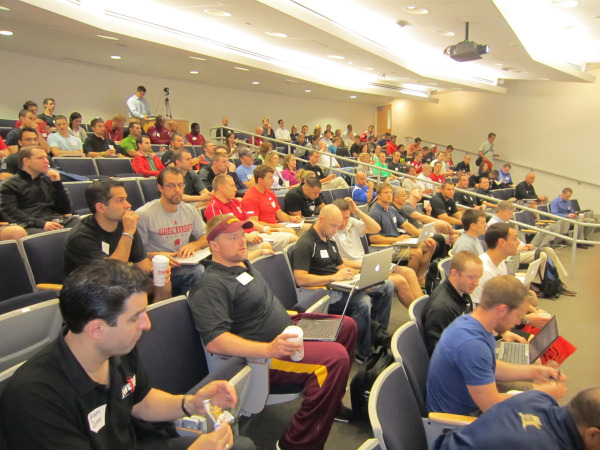 See the leaders in Sports Medicine and Performance at the 2012 BSMPG Summer Seminar! Seats are limited - Sign up before the last few seats are gone! Victor, the mobile market is a very disruptive movement to many software companies. How has Dartfish continued to succeed with more and more competition? Actually it helps the overall picture because many coaches had not realized before how important video was. An app is only once piece of a total solution and if you do not answer all the needs (or most of the needs) of an organization, you will not be successful. Dartfish has been serving this community for more than 10 years and we have listened to our client’s needs. This why we continue to be the driver in this market. We have developed apps as well and will continue with new ones to come, but always in a fully integrated and complementary approach (cloud, software and mobile). Dartfish.tv allows users to monetize their skill sets with revenue streams similar to the iTunes store. How do you see coaches take advantage of this in the world of sports performance? Many private facilities are looking for both a competitive edge and a way to keep profits from dissolving to their competition. How does this help coaches on salary such as college and professional ranks as well? There are many ways where coaches can create additional revenue or at least show a very professional image with great technologies. Coaches can sell video clips online (clips, drills, etc.,), they can start remote coaching services, they can post videos of camps and clinics, they can ask parents to subscribe to competitive events. 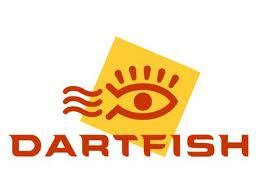 We have clients with thousands of videos on their dartfish.tv platform today. Many coaches want instant feedback or analysis live during training sessions. Most experienced coaches feel just the opposite that athletes should be viewing outside the field, court, pool, or track. Shouldn't analysis be more in the office and not in the field? What problems have you heard regarding this practice? Actually there is a fine line between doing too much on the field and not doing enough with video. A quick visual feedback on the field is very beneficial to the muscle memory learning experience (seeing is believing). However, doing too much can be disruptive and you will lose the impact according to our best users. Deeper analysis should be done after the training session to find out additional facts and reinforce what was communicated on the field. Fusion of data sets such as EMG and Force plates can be done with your system; can you share why this is going be a major and more common practice in the future? What is essential here is to be able to have the full picture. Too many times, athletes and coaches are presented with data and it is very complex to really understand what is going on just by looking at the numbers. We say that your data needs video! As more and more data systems are available to larger audiences, the fusion with video will help the understanding and communication process. It is an additive process. A picture or video may worth a thousand words, and the data/words are worth a lot, but the combination is worth a million words. Speaking of the future, without giving away too much can you identify the problems coaches and therapists have with video analysis with a busy team or clinical setting that will be alleviated with the innovations you are working on currently? We are working on offering a product for every step of the process. 3 Key elements are important for therapists and coaches: Communicate, analyze, and then share. The key is to have the solutions that are fully integrated within their processes. It is always difficult to first embrace something new (people hate changes) but as soon as you have your workflow well established and you see that you can reap the benefits (patients doing better, medals won, increased revenue) there is no more doubt. When the first vehicles were introduced, many moving companies resisted and kept their horses and carts….we don’t see them on the roads anymore. A few seats still remain for the 2012 BSMPG Summer Seminar - sign up today to avoid disappointment this Sat! The fusion of sports and medicine becomes a more potent mixture each day. Using tools that gauge performance with a high degree of accuracy allows us to quantify our results in almost any fashion imaginable. Tracking minute changes in the body such as heart rate, function, mobility and mechanics provides us information on our athletes that we can rely on to develop customized programs for each athlete. Real-time reporting functions provided by today’s latest technology make it simple and efficient to make evidenced based decisions in any setting. Doctors, physicians and trainers are all working closely with one another to bring the most comprehensive care an athlete can hope for. Student athletes are among the top demographic to benefit from this union of sports and medicine where coaches and trainers regularly evaluate hundreds of students regularly. Coordinated care breeches team practices in addition to advising on lifestyle choices and curriculum. Outside of institutions, merging is evident in private facilities where athletic development is the number one priority. Through the eyes of Dr. Thomas Lam, Director of Athletic Development at FITS Toronto, an environment focused on sports-science and coordinated care is a premier destination for training and therapy. Located in the hub of Canada, Dr. Lam’s two Toronto locations service every level of athlete, each equipped with a sports science lab. Tracking manipulations to the nervous system by evaluating the results in through changes to the biomechanical system, Evan Chait of Kinetic PT brings his discussion to OptoSource’s Fusion Track workshop. For attendees of the Boston Sports Medicine & Performance Group, the Fusion Track will be the ideal chance to learn about incorporating data collection into sports performance planning and get a look at the best tools for managing all of the streams of information sports performance programs rely on today. Dr. Thomas Lam of FITS Toronto on integrating objective analysis into an existing sports performance and medicine program. Evan Chait of Kinetic PT will discuss The Chait Neuropathic Release Technique (CNRT), a multidisciplinary diagnostic and treatment process that focuses on 3 tiers of health. The 3 Tiers include the nervous system, biomechanical system, and the movement pattern system. Using the cloud to safely and efficiently manage data. Incorporating multiple streams of objective analysis into existing programs. Tracking and trending change for coordinating care. Visit OptoSource for more information! See this track along with 22 other lectures to choose from during our 2 day event this May 19th and 20th. A few seats remain - sign up before the last one goes!!! Strength coaches seldom agree with one another. But for all the things and subject matter they disagree about, there is one thing that every coach certainly would agree on. It's not sets or reps. It's not the use of Olympic lifts, or periodization method, or even conditioning protocols. The one thing that all coaches agree on is the struggle to program and plan for large number numbers of athletes in a consistent and easy manner. It's the one thing that ALL strength coaches would agree upon. And now, thanks to Cal Dietz and XL Athlete, coaches can spend more time on the floor coaching and less time plugging numbers into excel files or adjusting programs because of an athlete's injury or because a sport coach changed training times. Click HERE to learn more about the XL Strength Program Developer. 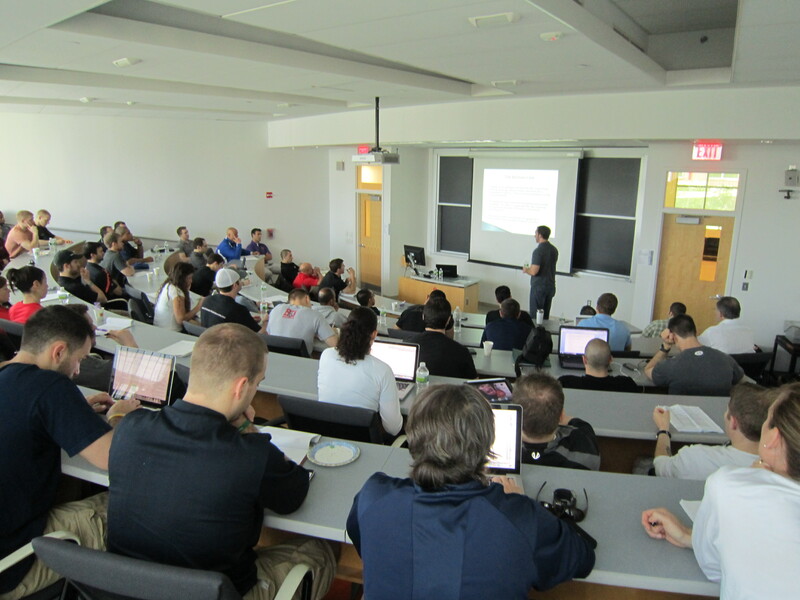 See Cal Dietz along with more of the nation's top hockey strength coaches and keynote speakers including Craig Liebenson and Chris Powers at the 2012 BSMPG Summer Seminar this May 19th and 20th. 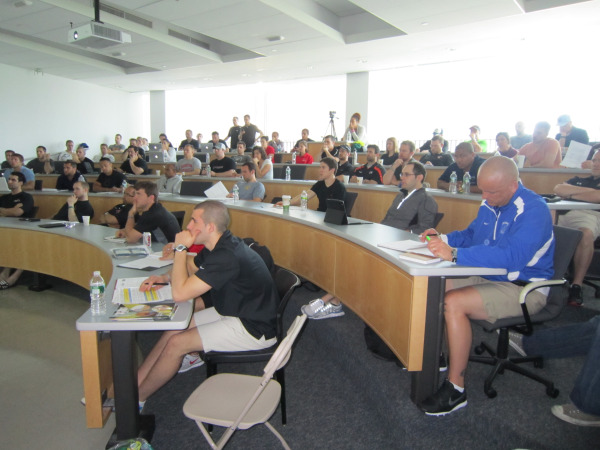 See Highlights from Coach Dietz's talk at the 2011 BSMPG summer seminar below.